starting now: wednesday . . . Fantastic LO! I love the colors, the placement of the photo and the fact that you just let the paper speak for itself. Fabulous! I love how you did the title and the colors are fab!!! This is wonderful!! Beautiful page! Love the papers too! Julie, this layout is GORGEOUS! I love it! Julie...you really worked this new Heidi collection. So stinkin' cute! Super cute! LOVE the oranges!!!! LOVE this layout! Love the colors and design! This layout is so fun, bright and well composed! I love your layout! I really love the fan folded half circle. Very cool! Love the half flower!The deatail that made your page. Just found your blog from a friend's reccommendation and all I can say is WOW! Beautiful pages and sketches. I think I owe my friend a big hug and a big thank you! I love how you used the different patterns and they work so well together. Gorgeous LO! I love the way you mixed the colors and patterns!!! Love your LO!! So simple yet beautiful. I LOVE your LO! What yummy papers!! Very bright and cheery and your handsome little boy is alays the highlight! Thanks for the chance to win! Love the half rosette! Also, might sound dumb but what do you use for your paint splotches.. a spray? Oh how cute. I love the colors!!!!!! Love that layout! Those papers are perfect with that photo! Beautiful use of these amazing papers for an amazing LO! 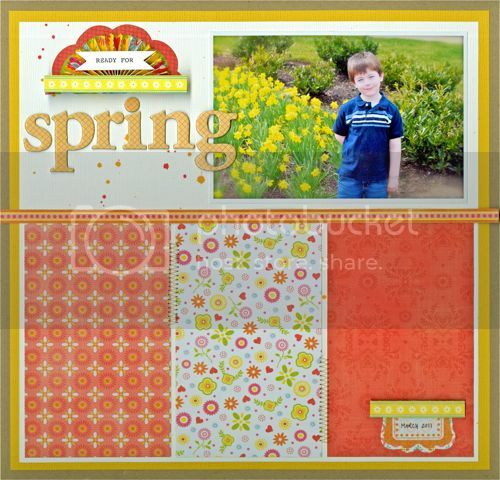 gorgeous colours and papers that are not usually used on a ''boy'' LO. super!! Great layout, love the color combination. My boy likes to help me find flowers to photograph. What a great layout and a really handsome boy! 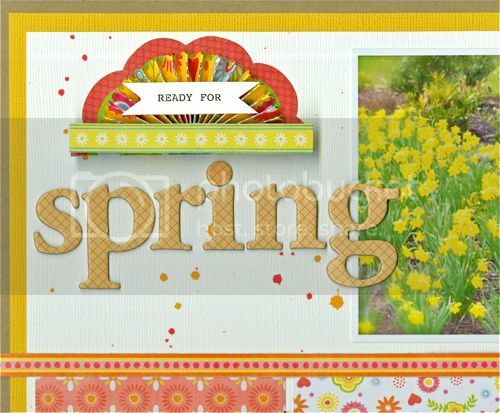 I love the simplicity of your page and the wonderful spring colors. Thanks for the inspiration!